It is very easy to get suckered into teams making splashy moves on the first day of free agency and thinking that “winning” in March will equate to winning in January. There is very often an inverse correlation between spending money in free agency and earning wins in the postseason. The Browns probably won’t be hosting any playoff games this year -- “definitely” would work, really -- but it’s hard not to like what they’re doing this offseason, one day in. For starters, the Browns went out and did exactly what their reputation said they’d do: play Moneyball. And Moneyball is not about finding fat guys who can get on base. It’s about exploiting market inefficiencies; it’s an economics game, not a baseball game. The Browns identified a trend in the NFL: the inability of most teams to draft and develop offensive lineman. There are certainly linemen who succeed and there are teams (hello, Dallas) that do a great job of finding stud linemen (the Cowboys themselves were playing a bit of Moneyball with that too, but that’s another topic for another day). But for the most part, there is a dearth of quality line play in the NFL and it’s really difficult to find young guys who can step in and make an impact. Offensive linemen used to be the safest possible pick, now they’re the riskiest. So the Browns went in a different direction, paying up for some quality linemen (more on that below). And then they did the most beautiful thing of all : trading for Brock Osweiler. I can’t believe it either, but it’s true. The Browns are soaking up $16 million in cap space by taking on Osweiler and they picked up a second-round pick from the Texans for their troubles. In theory they’re just a tax shelter for a bad investment by Houston; it will be curious to see what happens from the league if the Browns cut Osweiler. This could theoretically qualify as paying for picks, which is illegal at Bushwood. The Osweiler trade really is smart, though. The Browns aren’t contending this year, and they just added an incredibly valuable asset (a top-65 pick in the 2018 draft) to build out a roster in need of talent. So after locking up three young offensive linemen, the Browns are staring down five picks in the top 65 this year and four picks in the first two rounds next year. Whether or not the plan to deal some of these picks for Jimmy Garoppolo comes to fruition is irrelevant. If they pull it off, great. If not, they’re set up to get tons of young talent. The Browns have a great chance to come out of free agency and the draft with a haul of talent that will get them moving in the right direction. Cleveland Browns: Again, spending big early isn’t alway effective, and the Browns probably won’t win in 2017. But getting Joel Bitonio locked down on an extension, bringing in Kevin Zeitler (a double whammy because it hurts the Bengals) and locking down JC Tretter solidifies this line for the upcoming season when you factor in stalwart left tackle Joe Thomas. Imagine if they’d kept Alex Mack and Mitchell Schwartz. Cleveland can add a quality running back in this draft and whoever runs behind that line should see plenty of holes. Whatever young quarterback comes in has Kenny Britt and Corey Coleman to throw to and should get plenty of protection behind this line. Baby steps, kids. Tom Coughlin: A year after he was unceremoniously run off by the Giants only to see New York finally do the one thing it never did when he was around (spend huge money in free agency), Coughlin got to bust out the checkbook himself. And the early reports are pretty astonishing, although not too different from Jaguars offseasons of the past. The Jags threw huge money at Calais Campbell to pair him with Malik Jackson ( last year’s big name signing ). Campbell is a stud against the run, a guy capable of getting after the passer (eight sacks last year, 20 in the last three) and a versatile, underrated option who just cashed in big. Jacksonville also locked down cornerback A.J. Bouye, stealing him from the Texans and paying him handsomely for a breakout season in 2016. The Jaguars defense has zero reason not to be outstanding this year. Mike Glennon: No one’s been hosed more than Glennon in his football career when it comes to being put on the backburner as a backup. He was a five-star recruit out of high school and got stuck behind Russell Wilson at NC State. Then Glennon was poised to be the Buccaneers starter before being bumped by Jameis Winston when the Seminoles quarterback was taken No. 1 overall. Glennon has been incredible as a teammate in both situations and taken the honorable path by not complaining about playing time. He hasn’t been happy sitting in either situation (no one would be), but he took it all in stride. Now he gets a chance to start on his own team, taking over the Bears. The situation isn’t ideal, with Chicago losing Alshon Jeffery and not looking like a contender. But he’s got a chance to prove he deserves to start and he’s getting paid handsomely -- $14.5 million per year with $18.5 million in guarantees -- to do it. Jameis Winston: The Buccaneers went out and spent big on a deep threat for Winston, adding DeSean Jackson to put alongside Mike Evans and create a formidable duo in the receiving game. Evans morphed into an elite wide receiver in his third year with the Buccaneers and should take another step as he and Winston continue to grow. Jameis is known for some scattershot accuracy and loving to take chances down the field -- Jackson is going to be a big plus in helping him improve both. The Buccaneers were a dangerous offense last year; now they should downright explosive. Carson Wentz: The Eagles aren’t messing around when it comes to putting some weapons around their quarterback. They went out and signed Alshon Jeffery to a one-year deal worth $14 million . Jeffery turned down more money elsewhere according to reports because he liked what the Eagles are building. Couple Jeffery with Torrey Smith (three years, $15 million) , add in Zach Ertz and Jordan Matthews and the Eagles are starting to but some nice versatile weapons around Wentz. We’d love to see them pick up Jamaal Charles too and really establish the running game, but Howie Roseman did good work for his young quarterback on the first day of free agency. Washington Redskins: Thursday marked the first day of free agency around the NFL and the Redskins ... fired their general manager ! It’s not a bold move because it’s an insane move, canning a highly-talented individual in Scot McCloughan and then pointing to his personal problems as a reason for doing so. If you think that the firing of McCloughan and the Redskins’ statement on this matter is the end of things, you are sorely mistaken. The Redskins are consistently surrounded in drama, except for the last two years under McCloughan, and the franchise appears ready to shift right back into hyperdrive as they make their way along the road to dysfunction. Again: the Redskins fired their GM on the first day of free agency. This is, as far as we can remember, pretty unprecedented. The guy in charge of identifying, retaining and bringing in talent just got kicked out of the building on the most important day of talent evaluation. Carolina Panthers: The idea of going out in free agency and trying to find some cheap, young tackle talent that was a disappointment for another team, inking them to a low-cost deal and hoping to hit a home run, was a great one for the Panthers. Matt Kalil, brother of Panthers center Ryan Kalil, is a great potential example. And the Panthers signed him. Except then a funny thing happened: they gave him a huge pile of money. $55 million over five years to be exact, with $25 million guaranteed. Maybe the contract ends up better than it looks like, but off the bat, this feels like a bizarre way to try and solve the offensive line issues the Panthers face, by throwing money at a guy who was good coming out of school but struggled with and let go by the line-needy Vikings. Jay Cutler: It stinks to get fired from your job (even if you have sweet, tear-soaked odes penned in your name when it happens) and this is not me trying to rub it in on Cutler, who gets a raw deal as a locker room guy. But he’s been in Chicago for eight years and the Bears let him go in order to sign Mike Glennon to a big contract. The rumors and reports out there indicate that Cutler’s only option is to head to the Jets, where there is mutual interest. The Jets are rebuilding right now and not any good. Which means that Cutler will have to leave a bad team for a worse team, and when he gets there he’s going to play in an intense media market for a team without a ton of weapons and probably with a highly-drafted quarterback backing him up. It’s not a great situation for Cutler. Chargers: Russell Okung’s agent, who is actually Okung himself, did a heck of a job negotiating his last two contracts. The first deal with Denver looked like a loser because the Broncos declined his option and sent him back onto the market after just one year, which was not a good year. The second deal looks freaking great, with Okung inking a monster deal with the Chargers and about to earn $23.5 million guaranteed on a five-year, $53 million deal . Unfortunately, a lot of people in the NFL believe Okung may have tampered in this situation by talking to the Chargers before he was allowed to negotiate (he couldn’t discuss a contract during the legal tampering window because he’s not a registered agent). If that’s the case, might he have to fire himself if the NFL finds out he tampered with himself? It’s very confusing. Ranking free-agent surprises: Brock's a Brown; the Patriots did what? Another March, another Brock Osweiler stunner. The new league year opened Thursday with a torrent of team-switching. Free-agent dollars flowed into hitherto underfunded corners of the NFL landscape. The normally thrifty Super Bowl champs uncharacteristically dished out one of the biggest deals of the day. And the wreck of a franchise that plays in our nation's capital went way against the grain and opened the league year by firing its general manager. But the biggest shock of the day -- including even that last bit, which had grown sadly inevitable over the past week -- was the NBA-style deal the Cleveland Browns made with the Houston Texans, for a way-too-expensive quarterback neither team in the deal wanted. It is there that we begin our review of the biggest surprises from Thursday's opening of the NFL league year. In announcing the deal, Browns general manager Sashi Brown made it absolutely clear that the motivation was not Osweiler but rather the second-round pick that comes with him. The deal is a great one for the Texans, who rid themselves of last year's four-year, $72 million mistake with only a $10 million cap hit left over. That doesn't make it a bad one for the Browns, who have both cash and cap to burn, and can therefore absorb the Osweiler deal and just cut him if no one wants to offer them something else in a trade for the quarterback. Could Cleveland hold on to Osweiler? Sure. It's not as if he'd have to beat out Johnny Unitas to win their starting quarterback job. But that's not their plan at this point. Osweiler and his $16 million guaranteed salary are simply a means to an end. The Browns love picks. They want all the picks. They love having extra second-rounders in case it helps them deal for the quarterback they really want or in case they need to burn one on an unmatched offer sheet for a restricted free-agent with a second-round tender. It's about currency for the rebuilding Browns, and they want as much of it as they can get. The deal looks weird to the football establishment, but that's the point of the Browns right now. The people running the franchise are not of the football establishment. They're trying to find a new way to do things, since the ways the Browns have done things for years haven't worked. They have baseball people, analytics people, all kinds of different voices in there, and they're trying to figure out a way to build the league's worst franchise into something sustainably good. At the moment, the plan involves overspending. But they have the money, so why not? If the pick that came with Osweiler chained to it ends up producing a Pro Bowler, who'll care what it cost in March of 2017? It's a long way back from 1-15 and probably requires trying out a new side street or two along the way. But incumbent Browns guard Joel Bitonio also cashed in big, with a contract extension that added $10 million in cash to his 2017 income and could be worth more than $50 million in total if he were to play it out. Add in the deal Larry Warford got from the New Orleans Saints, the four-year, $35 million deal Ron Leary got from the Denver Broncos, and even the one-year, $8 million deal Luke Joeckel got from the Seattle Seahawks, and it's clear guards have managed to crack into the elite tier of free-agent paydays. They'll never make quarterback money, but they're getting closer at least to cornerback money. Always on the hunt for value in the middle or at the bottom of the market, the Patriots waded into the free-agent pool with a five-year, $65 million contract for former Buffalo Bills corner Stephon Gilmore. With Logan Ryan on the way out and restricted free agent Malcolm Butler's future in New England suddenly the subject of doubt, the Pats needed help in the secondary. Still, it felt weird to see them paying new-car prices on the first day. Hey, however bad your day was Thursday, it wasn't as bad as Andy Dalton's. The Cincinnati Bengals' quarterback lost two starting offensive lineman -- Zeitler and franchise cornerstone Whitworth. In the weeks leading up to free agency, it had become clear that Cincinnati wouldn't retain Zeitler, who was on the hunt for a big payday. But it always felt as if they'd do the right thing and bring back Whitworth, who was such a critical part of the franchise on so many levels. Instead, confident enough in their replacement plans that they didn't want to guarantee him anything beyond one year, they let Whitworth leave for the Los Angeles Rams. Now, a team that made the playoffs five years in a row before its 2016 flameout finds itself rebuilding in a critical area while its window to win ostensibly stands open. Not a lot of left-tackle solutions in this year's draft, either. At this writing, Romo is still with the Dallas Cowboys, mainly because it appears they convinced themselves during the day they might be able to get something for him in a trade. The Osweiler move makes it feel as if Houston was opening a spot for Romo, but that's apparently not a done deal yet, and you wonder what kind of leverage Jerry Jones might have that would justify the cap hit he'd take by trading Romo instead of designating him as a post-June 1 cut. The NFL free-agent market has been open for a solid few hours, and that means it's time to start declaring who did well and who didn't. The following takes are ironclad, indisputable and not subject to debate -- until, of course, we re-evaluate them next year. 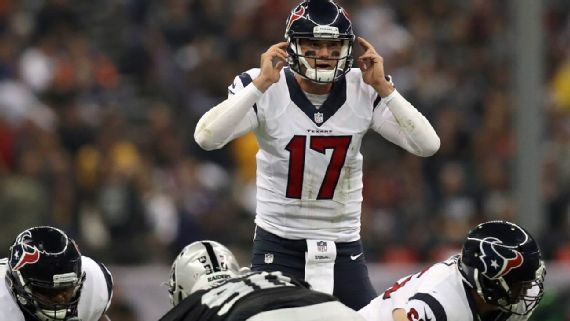 ESPN's Bill Barnwell took a quick but deep dive into the highly unusual trade that sent Houston Texans quarterback Brock Osweiler and two draft picks to the Cleveland Browns in exchange for a fourth-round draft pick. For the purposes of this post, however, let's acknowledge the big picture: It was a good deal for both teams, even if we don't know the Browns' final outcome yet. The Texans rid themselves of a player who will go down as one of the biggest mistakes in the history of NFL free agency, all while freeing up salary-cap space and adding to their cash budget. Yes, they had to cough up draft picks to do it, but that is probably a better outcome than keeping him in their locker room. And the Browns, of course, added another second-round pick to their collection in exchange for the easy absorption of Osweiler's $16 million in cap space. If they are able to trade Osweiler again, they can reduce that hit. But after rolling over $50 million from 2016, and entering free agency with more than $100 million in total space, it won't matter if they have to carry his full number. In essence, it appears the Browns have found a way to use surplus cap space to acquire a draft choice. See above. Rarely do we see NFL front offices attempt a move this out of the box. We'll be poring over this one for days and weeks to come. I don't have a single objection to the pending marriage between quarterback Mike Glennon and the Chicago Bears. The true commitment is relatively moderate, and the upside for both sides is high. It's true that Glennon hasn't played (or succeeded) enough to be considered "established," but I can echo what others have said: There are tons of people in league circles who believe he is a starting-caliber talent. The Bears won't be any less competitive with him than they were with Jay Cutler, and at 27, Glennon hasn't hit his ceiling yet. We don't know how good he can be. If he is as feared, a backup who got overpaid by a desperate team that tried to get cute, then it was a one-year mistake for a franchise that has plenty of work to do in other areas. There is nothing about this signing that precludes the Bears from drafting a longer-term answer. They entered free agency among the NFL leaders in salary-cap room, and who other than the McCaskey family cares if they spent their cash wisely? As for Glennon, there weren't many teams who were willing to hand him the keys even for one season. He'll get a legitimate chance to show he can be an NFL starter, and the Bears will get a relatively expensive one-year rental that could grow into something more. As we noted earlier this week, the Jacksonville Jaguars wrote 28 contracts worth an NFL-high $488 million during the past three free-agent markets. With only 11 wins to show for it, and having already jettisoned a majority of the players they signed over that period, they were the classic example of a team focused more on paper improvement than actual team-building. But even with a new football czar (Tom Coughlin) and coach (Doug Marrone), the Jaguars were back to their old tricks Thursday. They guaranteed defensive end Calais Campbell, who turns 31 in September, $30 million and then won the bidding war for cornerback A.J. Bouye with a bid of $26 million fully guaranteed. Some of Campbell's money might be guaranteed for injury only, and there is no doubt that in a vacuum, both he and Bouye are nice players. But history tells us this is no way to build a contender. There are reasons why the Arizona Cardinals didn't bring Campbell back, and why the Texans didn't hold on to Bouye. Those reasons will be evident in the coming year(s). Wake me up when the Jaguars start spending big money on retaining their own draft choices, and not on someone else's discards. Two aging receivers were snapped up quickly Thursday. Why? Straight-up speed, or at least the perception of it. DeSean Jackson, 30, agreed to terms on a three-year contract that included $20 million in guarantees from the Tampa Bay Buccaneers. And Ted Ginn Jr., who turns 32 in April, will sign with the New Orleans Saints. In Jackson's case, NFL Next-Gen statistics suggest he was still one of the league's fastest players last season. Based on information gleaned from data chips in shoulder pads, Jackson ranked in the top 10 of players in terms of gaining separation from defenders on deep pass routes. Ginn, meanwhile, isn't as fast as he once was but continues to attract suitors and will push his career earnings near $30 million despite never catching more than 56 passes for more than 790 yards in a season. He will push his career into an 11th season despite both his middling production and his unreliable hands. Over the past four seasons, he has dropped 18 passes in 280 targets. That drop percentage of 6.4 is the fifth-highest in the NFL over that span among qualified receivers. But his still-present speed makes him a genuine big-play threat, and he has caught enough of those deep passes to scare opposing defenses. His average of 15.1 yards per reception since 2013 ranks No. 15 in the NFL. According to a recent ESPN Stats & Information analysis, NFL receivers reach their statistical peak at age 27. But their production doesn't begin to fall off significantly until, on average, age 31. Speed preservation can delay that decline. Left tackle Russell Okung absorbed heavy criticism last year for firing his agent and accepting a team-friendly contract from the Denver Broncos that turned out to be a one-year, $8 million deal. It's doubtful that Okung anticipated massive demand at his position in 2017, but it all worked out for him in the end. As a bidding war erupted around him, Okung accepted what has been reported as a four-year contract with $25 million fully guaranteed from the Los Angeles Chargers. That means he will have earned $33 million in two years and, if he plays out his entire deal with the Chargers, $61 million over five. All's well that ends well. Defensive back Micah Hyde caught my eye during a Green Bay Packers minicamp in 2013 and to me, he has been one of the NFL's most valuable and versatile players since then. Hyde said in a statement that the Packers never made him an offer, a surprising revelation for a team that almost always locks up its best players, but their loss is the Buffalo Bills' gain. As a part-time player for the Packers, Hyde had eight interceptions, four sacks, six fumble recoveries and three punt returns for touchdowns. He can play cornerback or safety, functions well in blitz packages and has a clear nose for the ball. The Bills will expect him to be a full-time player, based on a five-year contract that includes $14 million in guarantees, but there is every reason to think Hyde can handle it. I usually hate when coaches describe someone as "just a good football player," but that really is what Hyde is. He is the kind of "glue player" that every team needs. I can't argue with the Packers' decision to prioritize a pass-rusher (linebacker Nick Perry) over a defensive back, but Hyde leaves a multifaceted role that will be difficult for one player to fill. I'm all for allowing aging players to move on, assuming that younger replacements are on hand. But it's difficult to understand the Cincinnati Bengals' strategy over the past two offseasons, during which time they've dissembled a good portion of the offense that helped them make the playoffs for five consecutive seasons from 2011 to 2015. Last year, they bid farewell to receivers Marvin Jones and Mohamed Sanu along with right tackle Andre Smith, and then saw their offense drop to No. 21 in scoring from No. 4 in 2016. Thursday, they lost two members of their starting offensive line: tackle Andrew Whitworth and guard Kevin Zeitler. Whitworth is 35, but he is still a really good player, and the Bengals badly misjudged his value on the market. And if you think Cedric Ogbuehi is a reliable replacement, you're fooling yourself. Barring a draft full of hits, the Bengals are going in the wrong direction from a personnel perspective. No team entered the offseason needing more help at offensive line than the Minnesota Vikings, who at most have two returning starters from 2016. Unfortunately for them, the demand for quality linemen far outweighed the supply. And double unfortunately: The Vikings declined to get caught up in the bidding wars that erupted for those who were available. In the end, the Vikings had signed only one potential starter, Riley Reiff. He could be a serviceable right tackle, or a desperation left tackle, but it's worth noting that the Detroit Lions -- after five seasons with him -- decided to replace him with free-agent Rick Wagner. Realistically, the Vikings still need a left tackle, one starting guard and perhaps a center as well. That puts a lot of pressure on their draft, especially when you consider they don't have a first-round draft choice. Lost in Thursday's drama was the Philadelphia Eagles' quick and effective upgrade of their receiver position, one they accomplished without mortgaging their future. We all know the Eagles had one of the NFL's least productive group of receivers in 2017, ranking No. 31 in receiving yards (1,849) and yards per catch (10.7). They also had the NFL's highest drop percentage (5.8). To give quarterback Carson Wentz immediate help, they signed free agents Alshon Jeffery and Torrey Smith to relatively reasonable deals. Jeffery, who when healthy can be a legitimate No. 1 receiver, will receive $14 million for one season. He'll enter the season knowing that 2017 will be the best chance in his career for a major payday. Smith, meanwhile, got a three-year deal worth up to $15 million. Both players were available for a reason. Jeffery played in only 65 percent of the Bears' plays during the past two seasons because of injuries and suspensions. Smith's yardage totals have decreased in each of the past three seasons, from 1,128 in 2013 to 267 last season for the 49ers. But they'll do their part to give Wentz a set of professional receivers. The San Francisco 49ers' decision to sign quarterback Brian Hoyer should not, under any circumstances, be viewed an obstacle to pursuing Washington Redskins quarterback Kirk Cousins. Cousins is caught in the Redskins' current drama and has already asked owner Dan Snyder to trade him. Niners coach Kyle Shanahan would love to have him. Hoyer? He's the guy you don't want starting more than a handful of games. History tells us that he either runs out of gas, or defenses catch up to him, or both, over the course of a season. In his career, according to ESPN Stats & Information, Hoyer has a 60.4 Total QBR in the first two months of a season. In the final two months, his QBR is 37.3. He is a high-end backup quarterback, which means he can handle himself respectably in limited playing time. No one in the NFL thinks the 49ers are content to enter the season with him as their unquestioned starter. 0 Response to "2017 NFL Free Agency: Browns scheming winners, Redskins look like lunatic losers"